Over several weeks of phone calls, meetings and text messages, Cleveland pulled off one blockbuster trade, for Andrew Miller, and nearly made another for catcher Jonathan Lucroy. The Indians had an unusual obstacle to contend with as this season’s Aug. 1 non-waiver trade deadline approached: Donald Trump. The Republican National Convention, at which Trump was formally nominated as the party’s presidential candidate, took over Cleveland’s Quicken Loans Arena between July 18 and 21. Progressive Field—the Indians’ home ballpark—fell within the convention’s security perimeter and was used as a staging area for the events next door. None of the club’s employees could enter the stadium or its offices for 15 days, between July 10—when the Secret Service began their sweeps shortly after the Indians had concluded their first-half schedule—and July 25. For the players, this meant that they had to find somewhere else to work out over the All-Star break and that they went on a nine-game road trip when the season resumed. “Felt like we were on the road for a month,” said first baseman Mike Napoli, upon returning to his home clubhouse. For eight top members of the front office, it meant that they had to bring their laptops every day to the home, 20 minutes from the ballpark, of 35-year-old general manager Mike Chernoff—with 41-year-old Chris Antonetti, the president of baseball operations, on speaker phone when he was on the road with the team—to plan a trade deadline that would be different from any they had ever experienced, in ways that had nothing to do with the GOP’s polarizing nominee. Over the years, the Indians’ front office has proven unusually stable. Antonetti has worked for the club since 1999 and Chernoff since 2003. Both were hired by Mark Shapiro, who had joined the team in 1991 and left 24 years later to be the Blue Jays’ president and CEO. Cleveland's trade deadline tactics have also been consistent: it sells, almost always successfully. Recent deadline deals have yielded prospects who have grown to form much of the current club’s core, including outfielder Michael Brantley (brought over from the Brewers in exchange for CC Sabathia, in 2008); designated hitter Carlos Santana (from the Dodgers, for Casey Blake, also in '08); starter Carlos Carrasco (acquired from the Phillies in the Cliff Lee deal in '09); and 2014 Cy Young winner Corey Kluber (from the Padres in a three-team trade in '10 that sent Jake Westbrook to St. Louis). The proper way to characterize the Indians’ modus operandi is to say that they are disciplined. They are a low-revenue (and therefore low-budget) organization whose Opening Day payroll has never exceeded $100 million and annually falls in the majors’ bottom half-dozen. They do not have the financial wherewithal to compete for the majors' best free agents, and so prospects are their lifeblood. If they are to win, it will be with players they have acquired and developed, who are young and therefore affordable and whom they do not easily relinquish. This is Cleveland’s process, and it is one from which it almost never planned to deviate. Until this year. This year, the Indians approached the deadline with an uncharacteristic acquisitiveness matched, perhaps, only by the man who had mounted the podium next door a week and a half earlier. They would agree on a pair of deals—big deals, beautiful deals—that had the potential to upend the league’s power structure. Only one of those blockbusters, though, would ultimately be completed. 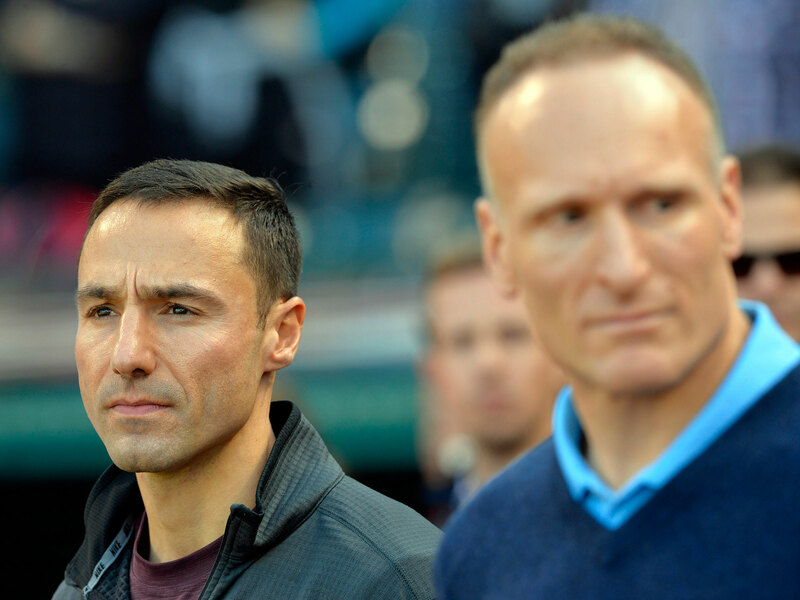 Indians president Chris Antonetti (left) learned from predecessor Mark Shapiro that trades are a zero-sum game. Well before Trump’s golden plane touched down in Cleveland, the Indians’ front office knew that this year was different—that this appeared to be the team's best chance since the late 1990s to end a World Series drought that is now in its 68th season. Cleveland took over first place in the AL Central on June 4, and by the end of a 14-game winning streak in early July, it had a seven-game lead. The Indians had the best rotation in the league—headlined by righthanders Carrasco, Kluber, Danny Salazar and Josh Tomlin, who had four of the top 15 ERAs in the AL before the All-Star break—and a productive offense with just the right mix of young phenoms, like 22-year-old All-Star shortstop Francisco Lindor, and savvy veterans, like the rejuvenated, 34-year-old Napoli. The club was also inspired by the NBA championship that had been won by LeBron James and the Cavaliers in June. Rather than viewing the title, the city's first since 1964, as affording them further leeway in their own quest, the Indians wanted to give Cleveland's beleaguered sports fans another one. The team still had a few obvious holes, though. The front office sought to fill them not with soon-to-be free agents but with players whose contracts allowed for team control after 2016. Such players could be with the Indians for what they hoped would be several seasons of contention, but, if the club disappointed, could also be flipped for more prospects down the line. One hole was at catcher, where incumbent starter Yan Gomes was not only batting just .165 but had also landed on the disabled list on July 18 with a separated shoulder. The market’s primary catching option was clear: the Brewers’ Jonathan Lucroy, who had just made his second All-Star team and had a contract that included a team option of just $5.25 million for 2017. The other hole was in a bullpen that was both middling and overtaxed, with an enormous burden placed on setup man Bryan Shaw and closer Cody Allen. The market for top relievers was broader than for it was catchers, but it was still limited. It included the Yankees’ flame-throwing, lefthanded duo of Aroldis Chapman and Andrew Miller; the Brewers’ Jeremy Jeffress and Will Smith; and Pirates closer Mark Melancon. For once, the Indians had not only the prospect heft to make a deadline splash but also the desire to deviate from their strict process. Their ideas weren’t limited to catchers and relievers, and as the deadline approached, they engaged in at least some level of negotiations with nearly every club that might have been thinking about selling. They got awfully close with some. But Shapiro used to remind his executives that no talk is cheaper than trade talk. “You’ve either made a trade, or you haven’t,” he would say. It’s ultimately a binary, zero-sum game. This would be dramatically confirmed for the Indians by Deadline Day. 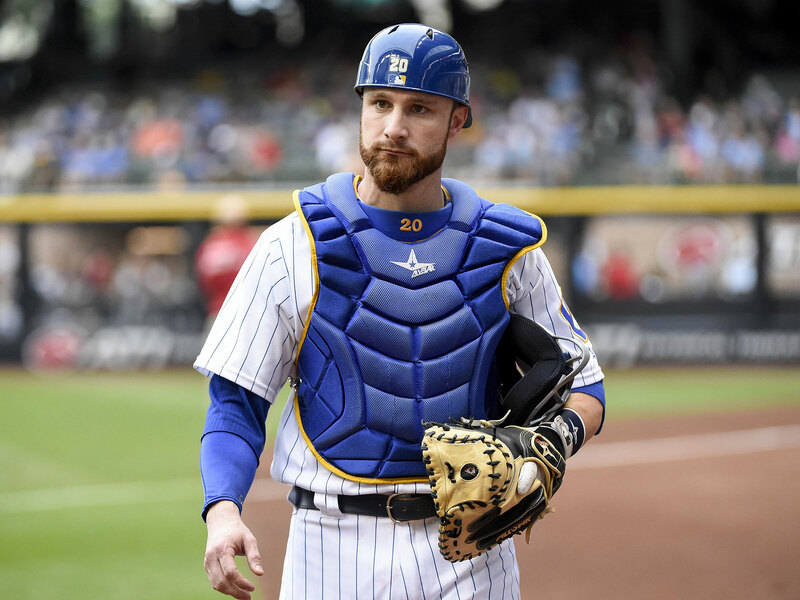 The Indians targeted All-Star catcher Jonathan Lucroy of the Brewers but the deal hit a snag. Baseball’s trade season begins to heat up even earlier than most fans think. Antonetti first reached out to Yankees general manager Brian Cashman about Miller in mid-June, when New York was still insisting that it would not be sellers. Chernoff, who would lead the Indians’ pursuit of Lucroy, had mentioned the catcher’s name to David Stearns, the Brewers’ 31-year-old GM, before the calendar flipped to July. So began a period in which the executives, working on no more than six hours of sleep a night, conducted a constant dialogue with their counterparts via phone, email and text message. Over the course of a month, Chernoff and Stearns exchanged more than 50 texts centered on Lucroy, in which they batted around packages that included combinations of at least 20 different players. The Indians knew that they would have to pay a steep price in prospects in exchange for players of the caliber they were discussing. But they would be giving up more than cold assets. They’d be giving up people in whom they had invested a lot, not just financially but intellectually and emotionally: people they had scouted and had come to know, in some measure, when they were still teenagers; people whose drafting or signing they had celebrated; people whose careers they had nurtured and whose skills they had helped develop. Consider the four players the Indians traded to the Yankees in exchange for the 31-year-old Miller—an elite lefty with two years and $18 million remaining on his contract—last Saturday. Everybody knew about outfielder Clint Frazier and pitcher Justus Sheffield, who were first-round draft picks out of high school in 2013 and '14, respectively, and had recently been ranked Nos. 21 and 69 on Baseball America’s midseason Top 100 prospects list. In many ways, though, it was just as painful to part with righthanded relief pitchers J.P Feyereisen and Ben Heller, both of whom Cleveland had also drafted, the former in the 16th round and the latter in the 22nd. The commitment to both was starting to pay off: In three minor league seasons, Feyerisen had pitched to a 1.80 ERA; in four, Heller had pitched to a 2.77 mark. The Indians felt similarly about the quartet of prospects they reportedly agreed to trade to the Brewers for the 30-year-old Lucroy on that same night: catcher Francisco Mejia, the 70th-rated prospect on BA’s list; shortstop Yu-Cheng Chang; outfielder Greg Allen; and pitcher Shawn Armstrong. It was a lot to give up in a single decade for Cleveland, let alone a single evening. Though it hurt, the Indians' front office felt it was worth it. Lucroy still had to agree to waive the clause in his contract that had included the Indians among the eight teams to which he could refuse a trade. But when Cleveland's executives left their offices at Progressive Field—where they had reestablished their headquarters, post-Trump—at 2:15 a.m. ET on July 31, they felt confident that they had just buttressed their first-place club with not one but two All-Stars. By 8:30 the next morning, both the Yankees and the Indians had exchanged and examined the medical records of the players involved in the Miller deal. While trades that are agreed upon minutes before the 4 p.m. ET deadline may be emailed into the commissioner's office, those consummated with time to spare are usually entered into a web-based system called eBIS. In this case, New York entered the parameters of the transaction into the system, and Cleveland reviewed it and clicked “submit.” Then it was time for the Indians to undertake one of the most difficult parts of any trade: informing the players involved. The task fell to Chernoff, who called Feyereisen, Frazier, Heller and Sheffield one by one. The players received the news differently, as all players do. Some struggled with it, believing that they had done something wrong to be dealt away from the only professional organization for which they’d ever played. Chernoff assured them that it was the opposite: They had done so much right that they had made themselves desirable, and that the Indians were grateful to them and would help them, going forward, if they could. One player expressed how odd it would be see his friends and teammates with the Akron RubberDucks, the Indians’ Double A affiliate, from the other dugout. Chernoff said he understood. Frazier, a 21-year-old Loganville, Ga., native who has long, red hair, had a particular concern related to the Yankees’ famously stringent personal grooming rules. “How soon do I have to cut my hair?” Frazier asked Chernoff. “You’ll have to work that out with the Yankees,” Chernoff said. Chernoff’s reply was meant to be lighthearted, but Frazier didn’t laugh. With that task accomplished and Miller in the fold, the Indians turned their attention to wrapping up Lucroy. By 10 a.m., they knew: Lucroy wasn’t going to be wrapped up. Despite previous public statements that he wanted to play for a contender—which the fourth-place Brewers definitely were not but the first-place Indians definitely were—Lucroy refused to waive his no-trade clause, reportedly unless Cleveland agreed to relinquish the club option in his contract for 2017. That was Lucroy’s right, but it was not something the Indians would ever do. Much of the team's interest in him, and a major reason why the Indians agreed to hand over so many prospects for him, stemmed from the promise that he would be their property beyond this current season. Shapiro’s mantra was intended, in part, to remind his old front office mates that they should quickly move on from trades that didn’t happen. The Indians moved on from Lucroy, but that process was complicated by one factor. While no one knew the Miller deal was in the works until it had been completed, word of the Lucroy agreement had leaked to the media. That meant that the four prospects involved knew about it, and now had to remain with an organization that had very nearly traded them. Meanwhile, the parent club’s current catchers—Chris Gimenez, Roberto Perez and the injured Gomes—knew about it, too. In retrospect, the Indians probably wouldn’t have minded if the Miller deal had been leaked and the Lucroy one had stayed secret. There was one positive for the prospects at least: They now knew that the industry valued them highly. Still, Cleveland had gotten Miller, and now it was time for a different member of the Indians’ front office to get to work: Mike Seghi, the club’s traveling secretary. Seghi has had his job for more than 40 years, and he knows better than anyone how to get a baseball player from here to there. Seghi quickly had a flight and temporary housing arranged for the reliever and will soon help him find a more suitable long-term place. While it can sometimes take several days for a player to make his way from one club to another, Miller was in uniform and made his Indians debut the day after he was traded, on Aug. 1. He gave up a home run to the first batter he faced, Minnesota's Joe Mauer, in a 12–5 loss to the Twins. The trade deadline had arrived a few hours before Miller threw his first pitch for Cleveland. As the clock was winding down, the Indians acquired outfielder Brandon Guyer from the Rays for a pair of low-level minor leaguers, outfielder Nathan Lukes and pitcher Jhonleider Salinas. The Indians had been talking to Tampa Bay about the 30-year-old Guyer for a while: He hits lefties well and has a 1.082 OPS this year, 350 points better than the Indians’ overall mark. Guyer is no Lucroy, but that’s a thought that helped no one. Lucroy never was an Indian, and that’s the only way his would-be club could look at it. On Monday, Lucroy was traded to the Rangers, another first-place team but one not on his no-trade list and one located near his home state of Louisiana. To get him and closer Jeremy Jeffress, the Rangers gave up outfielder Lewis Brinson and pitcher Luis Ortiz, both top-75 prospects, and a player to be named later. “Now, moving on to the @Rangers let's take this bad boy to the 'ship! Really excited and can't wait to get after it!,” tweeted Lucroy. When the deadline struck at 4 p.m., laptop keys suddenly stopped clicking in Cleveland's war room at Progressive Field. Antonetti, Chernoff and the members of their staff took a deep breath and looked appreciatively at each other. Weeks of late night conspiring and of quick and unhealthy lunches from Chipotle and Harry Buffalo sunk in. Hundreds of possibilities had been distilled into two realities, and they were confident they had done all they could, in their unfamiliar role as deadline buyer. Still, no one clapped, and no one cracked open a beer. If there was celebrating to be done, they all knew implicitly, it would happen in the fall.